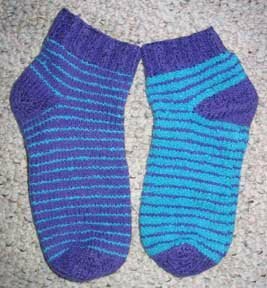 This week I finished a pair of socks with cascade fixation yarn on size 3 needles. I used 48 stitches per round and it's a little stretched. Also they drew up just a little in the first wash. I've started another pair a big bigger, we'll see how that goes. I'm teaching a sock class in a month, so I'm trying out several things. Also I made one pair on my prefered DPN's and the other with 2 circs for the class. I'm just more used to the DPN's. I'm sure I could come to love the 2 needle method, but not yet. Still need to try out the loop. 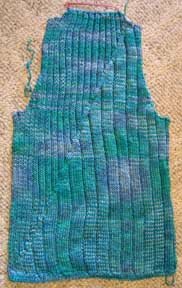 I'm also working on a sleeveless top in Berrocco Cotton Twist. Here is the back, I'm got about 10 more rows on the front. 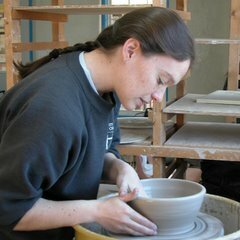 I'm trying to have it done in time to wear it to the Mt Mitchell Craft Fair in a couple of weeks. It finally feels like I might get there. Congrats on starting a blog! :) I love how the socks came out. Very cute! The tank is look great too. Hope you have fun with blogging! So when and where are you teaching a class on knitting socks? I like to knit, but have never tried socks.